For an in-depth exploration into Indonesian arts, Sumunar presents residencies in educational settings. Artists Joko Sutrisno and Tri Sutrisno are classically trained performers who have become highly skilled in working with school children and helping educators integrate the arts into the curriculum. Over the past 13 years, more than 10,000 students have participated in their workshops and residencies. Both students with western musical training and those with no prior music experience find gamelan music and dance interesting and enjoyable. Indonesian music residencies teach students about a fascinating new culture and give them insights about geography, literature, language, and customs entirely different from their ordinary lives. Students are challenged to learn a new kind of melody and rhythm and an entirely different method of teaching. Residencies can last anywhere from a few days to several weeks. IPAAM will provide instruments and deliver them to your school. 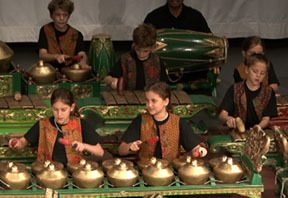 Gamelan and dance residencies are booked through Sumunar—contact us at info@sumunar.org or 612-237-9862. Schools can provide full or partial funding. Funding assistance can be sought through grants from the Minnesota State Arts Board, Metropolitan Regional Arts Council, COMPAS, the St. Paul Foundation, and other agencies. Sumunar can assist you in the grant-seeking process; please ask for details. Some of these activities are funded in part through an appropriation by the Minnesota State Legislature from the Minnesota Arts and Cultural Heritage Fund with money from the vote of the people of Minnesota on November 4, 2008. How are gamelan and dance taught? In March, 2011, Joko and Tri Sutrisno taught a residency at the Main Street School of Performing Arts, Hopkins, MN. At the end of the residency, the students put on a performance for their parents and class mates. For other residency inquiries, please contact Sumunar.